Lowdown: A Nazi fugitive is getting the better of the Israeli Mossad agents that captured him. You can’t blame director John Madden for doing the same film again and again. He may have won his fame with Shakespeare in Love, but The Debt is totally different. It’s the exact opposite of a film, even if it is also a fictitious story based on some whiffs of truth. Back in the sixties, three Israeli secret agents come back from Eastern Europe reporting they have eliminated Vogel, a sadist Nazi doctor that experimented brutally with Jewish inmates during the holocaust (and, like the baddie from Marathon Man, is modeled after Josef Mengele). Forward the clock to today’s time, and we meet the elderly version of the three (Helen Mirren, Tom Wilkinson and Ciarán Hinds) in Tel Aviv. Things are weird at first but turn clear very quickly with Hinds jumping in front of a fast moving truck (in Israeli traffic! ): the three have been traumatized by their past escapades. To answer the question of what it is, exactly, that blemished their souls, we venture back to sixties’ East Germany in the company of our three heroes’ younger versions (respectively, Jessica Chastain, Marton Csokas and a Sam Worthington copying Eric Bana's Munich type role). The team’s woman engages Vogel (Jesper Christensen), now a gynecologist, and uses his fertility treatments to have him captured. As the trio hold Vogel in their apartment, desperate to find a way out of East Germany and bring the doctor to justice in Israel, cracks start to appear. Slowly but surely Vogel is getting at them. The result of everyone’s efforts is The Debt, a thriller with a tiny spec of action, lots of good acting, and a serene feeling of authenticity in the air. As in, I don’t know where they shot East Germany at, but the Israeli parts of the shoot felt very Israeli (and according to the credits, at least some of these were actually shot in Israel itself). 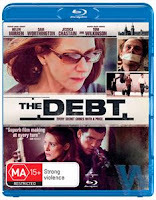 Moving on to the philosophical realm, it is clear The Debt is one of those films that pose to beg the difference between perception and the truth. I won’t go further there because it would totally bloop the film for you, but I will say that asking this question in the context of the Jewish/Nazi question puts in under interesting light. Then again, putting it in the light of contemporary Israel automatically generates in the viewer's mind a certain comparison between the young Israel fighting with its ex Nazi nemesis and the Israeli/Arab conflict. Although this last analogy is not explicitly implied at by The Debt, my opinion is that it is this ambiguity of the film’s dealings with this question that is The Debt’s weak spot: given the setting, the question will be automatically raised in the minds of most viewers; yet it does not receive adequate treatment. It is as if The Debt is trying to be perceived a smart film through ambiguity. Best scene: A visit to the gynecologist turns sour for the gynecologist. As analogies/metaphors go, this is probably the best I’ve seen in a while. Overall: A solid thriller with some inherent issues. 3.5 out of 5 stars.